If your marketing department has launched a newsletter campaign, congratulations! Strategically created newsletters are among the most popular ways for today’s marketers to disseminate information. In fact, it’s so effective that 64 percent of marketing specialists worldwide use this tactic to connect with their customer base. The study found that newsletters are used more than email subscriptions, email opt-ins, events and invitations, and re-engagement campaigns. Perhaps even more importantly, 60 percent of consumers consider newsletters their favorite way to receive vendor updates and promotions, according to a 2015 report. Company news, such as updates, improvements, new products, awards, volunteer projects, etc. People like to be informed of sales, but selling shouldn’t be the main focus of an email newsletter (send such offers in promo-specific emails). Think of your newsletter as a trusted friend your reader has let into their home/inbox, not a pushy salesman with his foot in the door. The average person spends just 51 seconds reading a newsletter. Don’t take this stat personally. Keep content easy to scan with content blocks, brief blurbs, snapshots, takeaways, and bullet points. Use these elements in conjunction with highly visible call-to-action buttons that lead readers back to your site, blog, or social media network for more information. The point of a newsletter is to build a relationship with your audience, to inform and educate them, and to snag some clicks, which, in some cases, can lead to a sale. If you tell readers to look for your newsletter each week, be there. Pick a frequency and stick to it. Many people don’t like surprises, last-minute drop-ins, or no shows. If your subject line isn’t compelling, interesting, intriguing, or thought-provoking, your reader may not make it past “Hello.” Clearly state your company name in the “from” section, and when crafting a subject line avoid generic titles; instead, write a teaser about the newsletter’s content. Using a “do not reply” email address for newsletters indicates responses won’t be seen or answered. 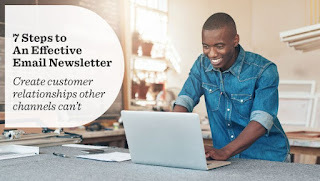 Allowing customers to reply, then responding to inquiries and comments, sets a friendly tone and provides you with valuable insight, feedback, and questions that very well may improve your next newsletter. Unsubscribers are a fact of life and nothing to take personally. And the harder you make unsubscribing, the greater the likelihood readers will hit that dreaded SPAM button. Make your unsubscribe link easy to find. Creating a personable, presentable, and effective email newsletter takes work, but when done well it can create valuable customer relationships that other channels can’t.